According to a 2012 survey conducted by carfinance.com, 64 percent of recent new-car buyers described negotiating the price of their new car as the worst part of the purchase process. This really shouldn’t be surprising. Most new-car buyers go through the shopping process maybe once in five years. Car salesmen, with whom shoppers must do battle, hone their haggling and upselling skills on a daily business—that’s their job. Yet, despite all the care and caution shoppers bring to the dealer when purchasing a new car, few stay on their toes when it comes time to service those same vehicles. It’s worth noting that many dealerships pay their service writers—the folks diagnosing your car—on a commission basis, just as they do their sales staff. Simply put, the guy who’s going to have your car fixed makes more money if he sells you more stuff. Commission programs for service writers vary greatly, and few of these guys are on straight commission. Most, however, can make more money by padding the work order with extras including fuel-injector cleaning, premature engine and cabin air-filter replacement, and inflated scheduled-maintenance services. But, do service writers ever go so far as to fabricate problems to pad the repair bill? Read on and we’ll let you decide. This is the true story of “Jerry” and his 2008 Mercedes-Benz R350. It’s a cautionary tale. Jerry bought his R350 new from the same dealership at which he he would go on to have it serviced and repaired. Once the warranty expired, Jerry continued to bring his car to the same dealer because that seemed to be the logical thing to do. After all, who better to fix a Mercedes-Benz than an authorized representative of the factory? As luck would have it, Jerry’s R350 required more post-warranty repair work than most folks would find reasonable. Replacing most of the vehicle’s Airmatic rear suspension proved especially pricey. Over time, Jerry came to notice that with each repair estimate came additional recommend repairs—wholly unrelated to the original problem—that generally doubled or tripled the total cost of the service visit. Because Jerry had brought his Mercedes to a Mercedes dealer, he assumed that the suggested additional work was entirely necessary. Still, with each passing service-department visit, Jerry grew more skeptical. How can one car need so much repair work? All told, Jerry had spent approximately $9000 over roughly three years on post-warranty-coverage work. To Jerry, that seemed excessive. The Mercedes-Benz dealer recommended more than $2000 in work in addition to replacing the thermostat. 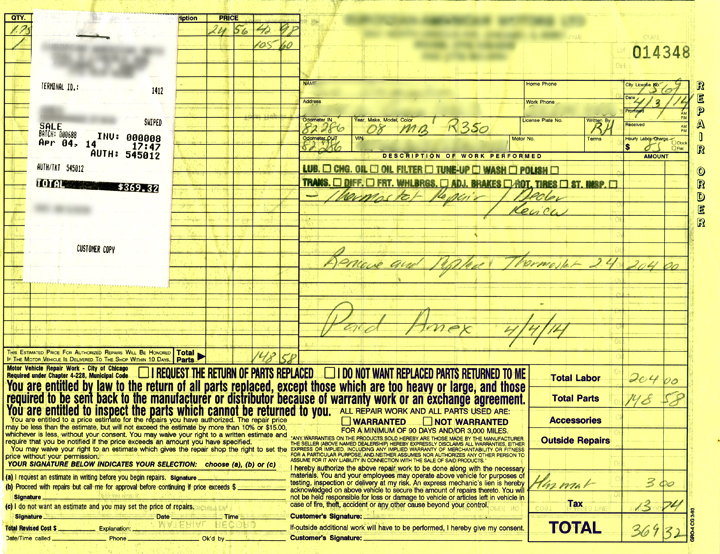 When Jerry’s thermostat went bad, the dealership again presented him with a professional-looking work-repair estimate, which included the core problem, the faulty thermostat, plus an astonishing $2000 in additional recommended work (see above). Determined to cut his repair costs, Jerry declined to have the dealer perform the work, and instead picked up his car. Then a funny thing happened: the service writer offered Jerry a 15-percent discount on the repair order. Jerry declined the offer, somewhat stunned to learn that service charges at the luxury-brand dealership were in any way negotiable. Yelp! loves this repair shop, and now Jerry does, too. Per an anonymous call to the shop, the same brand thermostat the dealership would likely have used was installed in Jerry’s Mercedes. Jerry did a little research and located a well-regarded independent shop specializing in high-end German cars. Jerry brought the R350 to the shop along with the dealer’s list of recommended work. After a brief inspection, the shop determined that all of the $2000 worth of recommended work was unnecessary or premature. Also, the shop was able to replace the thermostat for almost exactly half the price of the dealership–this, using a brand-name thermostat that is likely the same part the dealer would have used. A quick Yelp! check yielded some interesting findings. The Mercedes dealership currently has a 2.5-star rating on the review site. Stripping out just the 14 service department reviews, the rating falls to about 2.4, which rounds back to 2.5 on Yelp! The independent shop has been reviewed by a solid 40 customers and enjoys an impressive 4.5-star rating. With the exception of a single 1-star post, every other customer awarded the shop 4 or 5 starts. At this time, it is very unlikely Jerry will be returning to this particular Mercedes dealer for future work. Unless you’re buying a car or shopping for souvenirs in Cozumel, you likely don’t spend much time haggling over the price of many purchases. Yet, apparently this particular Mercedes dealer is building sufficient margin into its work estimates that it can afford to “work” with customers on the bottom line. The question is, wouldn’t you really rather just know what the fair price is up front? A major service at 82,755 miles? Mercedes call for R350 service visits at 78,000 and 91,000. There’s nothing to be done at around 83,000. The dealership service writer was apparently too lazy to even break out a calculator when padding this work order. 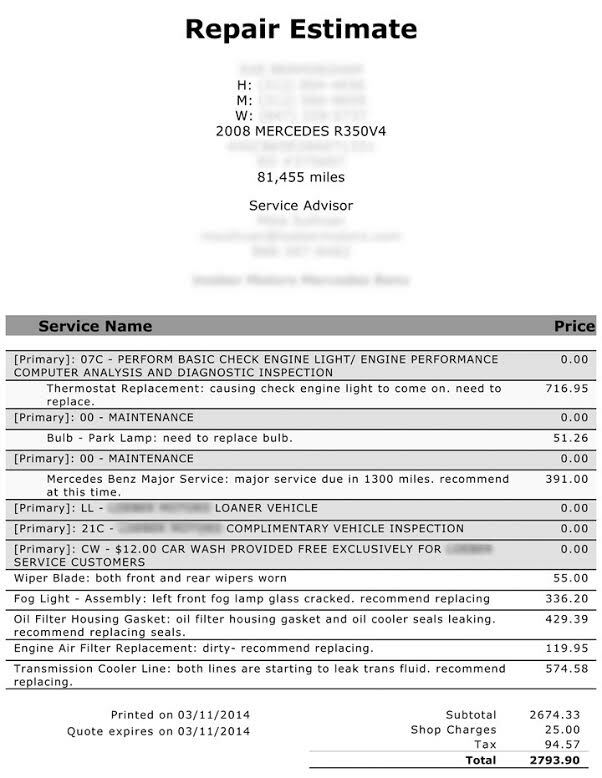 The “major service due in 1300 miles” note suggests that Mercedes-Benz recommends a maintenance visit around 82,755 miles, which isn’t the case. 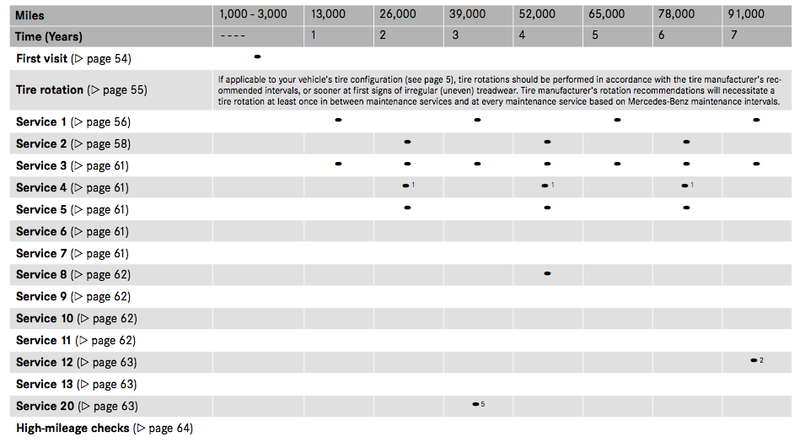 Per Mercedes, the R350 should be serviced at 78,000 and 91,000 miles (see above). More than double the price? It bears repeating that the better-reviewed independent repair shop performed the only work necessary for slightly less than half the price the Mercedes dealer estimated for the work. Yes, the dealer offers a free loaner car and car wash, but that doesn’t come close to explaining the price gap. Additionally, the dealer’s Yelp! Reviewers don’t speak well of the car wash.
Jerry’s problem with the R350’s air suspension took place just 1700 miles prior to the thermostat issue. In just that short time, according to the dealership, the fog light broke, the oil-filter-housing gasket began to leak, the transmission cooler line began leaking, and the wiper blades all went bad. Since none of these issues were made note of on Jerry’s previous repair estimate, we can only assume that the dealer missed them last time, or that this vehicle has had a very rough couple of months. A quick online search nets original-equipment-quality Fram-brand air filters for as low as $16.70. One can only assume that the dealership either seriously marks up the cost of air filters, or that the hourly-rate mechanic replacing the filter is very, very slow. Jerry’s story reflects his experience with a single vehicle at a single dealership. There are certainly dealership service departments that work honestly and charge fairly, but there are also plenty that work just like this Mercedes store. It stands to reason that the sales culture of a new-car showroom would extend to other departments of a dealership. It is for that very reason that the same caution consumers exercise when buying a car be employed when having that car serviced. Think your repair estimate is out of whack? Then don’t have any work performed until you get a second opinion. And if you find a good independent shop that you come to trust, spread the word. Keeping honest mechanics in business is good for everyone. Regarding scheduled maintenance; always check your owner’s manual. Dealerships frequently package scheduled maintenance services with costly and unnecessary (like the aforementioned fuel-injector cleaning) repairs. If your manual doesn’t call for it, don’t let the service writer sell you on it. The $391 service called for on the estimate above falls between two services that don’t involve much more than oil changes and miscellaneous inspections. The real work required should not retail for more than the combined cost of a dozen Jiffy Lube visits. Written by: Tom Appel on June 2, 2014.on September 13, 2018.